Given the distance and apparent cultural disparities separating Switzerland and Jamaica, the former country may seem like an unlikely cradle for dub-minded musicians. However, as Bern-based Swiss native and “dub scientist” Dubokaj explains, “the mountains are dub instruments” because of the echoes they produce. 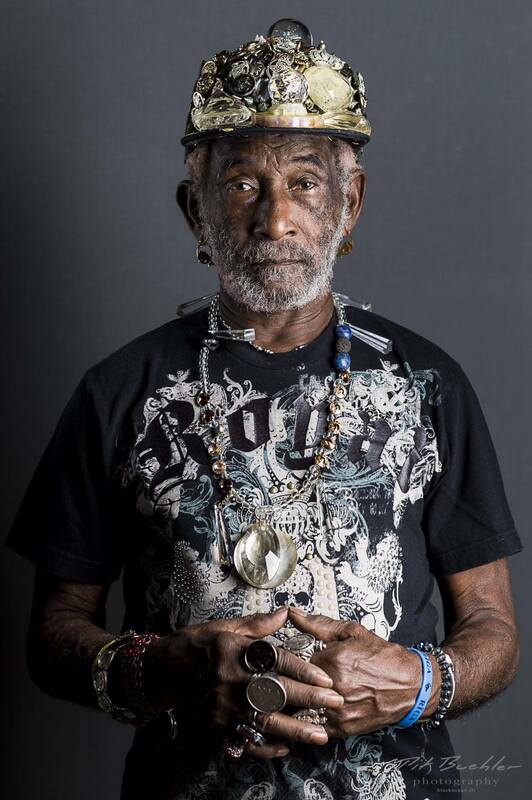 They’ve attracted one of the genre’s visionary artists—none other than pioneering Jamaican producer and engineer Lee “Scratch” Perry—who moved to the Swiss Alps after shutting down (or allegedly burning down) his famous Black Ark studios in Kingston. He hopped on the phone recently for a quick and typically esoteric chat with a dub-minded countryman about Switzerland’s affinity for resonant sounds. Dubokaj: How are you today, Mr. Perry? Lee Scratch Perry: The sun is shining, and the weather is good. The life in us is shining here in Switzerland. The sun is shining in America and shining everywhere with love—perfect love, unity and harmony and peace, and love for the people who love God, for the people who love God will forever reign and shine. The people who love God will have no problems. They will be the anti-problem. People who love God will have no war; they will be anti-war and be in perfect peace. Perfect unity to all mankind. We can smile when it’s cold and when it’s hot. We give thanks for the weather. D: What brought you to Switzerland? LSP: You have the sun, the mountains, the trees, the plants, the flowers and the roses. I live here because of the energy. The trees are perfect and the stones are perfect. I love perfection, and the Earth is perfect. I’m living here because I love the country and the weather. I love the storms and to see the ice. I’m living here because I do not wish to be poor. I don’t love poverty. I don’t really know how to deal with it. My country is poor so I left to go to Zurich because I was born to be rich. D: Do you still get behind the boards in the studio, or are you mainly doing vocals now? LSP: I do everything: I produce, I arrange and I’m a singer and a DJ. My brain becomes like a computer, so you just tell me what you need. If you need something for children, we’ll make something for children. I think we have to make something for children because if we get too far from children we won’t make it anywhere. D: Back in the Ark days you used to treat the tape to put vibes in it. What do you do to manifest those vibes when you’re recording digitally? LSP: I make my microphone in the studio pick up when rain comes, the lightning flashes and the thunder rolls. I put my microphone in the bird nest with birds to record the bird coos and the rain. That makes the energy. D: Do you listen to modern dub or modern music in general? LSP: I love music. I adore it. So whatever you send to me that’s talking about life and the future—I’m available. Just let me know if you need dub. And you really need dub, because children go crazy for dub now. We’ll take the music to my secret laboratory, to the Merlin-Magic-Master, Emperor Lee Perry. I’ll be available for whatever dub you wanna make, whatever eggs you want to lay. D: Would you like to go up to the mountains with me and record echoes? LSP: That would be fantastic. That will be planet number one. We’ll trade wind and echo in Merlin’s secret laboratory. Lets go up to the magic mountain and we will arrange a magic spell, a magic echo chamber. D: I know some nice echoes already in these mountains, so we really have to do this. Do you have any favorite mountains in Switzerland? LSP: We won’t be disappointed in the mountains because the mountains never let me down. Anything you want, just tell me. Tell it to Dr. Perry and he will help you out. So we’ll go to the mountain and make echoes. We can do whatever we want to do. You can do what you love, and I can do vegetables. D: I would love to add some curry to the mix, is that okay? D: Curry. That good spice. LSP: Do you love Jesus? I would invite him to the mountain top. I would love to go to the mountains to do something like that—a weekend in the mountains cooking vegetables. Whatever you want to roast is your business. And if we want we can roast the devil in the mountain too. We’ll have roasted the devil in the name of Jesus Christ of Nazareth. Whenever you’re ready, let me know. I have some shows I have to go to in London: two days in London, and then I go to Canada. D: Don’t worry. We can do it in June or July, as there is still some snow in the mountains now. LSP: It’s just snow and, like I said, I’m addicted to snow: to the truth. Dubokaj’s album, Alpine Dub, is out now. Listen to a track here.